The SSW LS1 wiring harness, as well as the LS6, LR4, LM7,LQ4, LSX wiring is based on the General Motors 411 electronic control module. The SSW LS1 electrical wiring harness has full diagnostic capabilities, and a 4L60E controller. 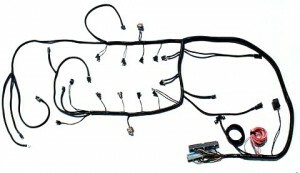 The Ls1 wiring harness consists of all connectors needed to run the application properly. We custom make all of these wiring systems in house, so if you would like additional length on a mass air flow sensor or injector trunk; due to a supercharger being installed, let us know. The LS1 or LS6 engine is a great choice for the first time fuel injection installer. If you have previous mechanical knowledge, connecting the nine wire LS1 power distribution block will be painless. We make this LS1 wiring harness with a fully supported diagnostic link communication system, that allows you to re-tune the LS1 computer program. If you live is a state that requires the LS1 wiring system to have a real full emissions system, let us know and we can calculate that in your harness build. If your vehicle is non-emissions, you have many options when it comes to the LS1 computer program. We have programs available that allow you to run non-emissions and delete the rear heated oxygen sensors (HO2S). Allowing the computer to calculate air to fuel ratio quickly. In open loop, the sensors used to control the engine are : The CTS sensor, TPS sensor , MAP sensor, MAFS and IAT sensor. The heated oxygen sensors only come into play when the computer goes into closed loop. When in closed loop , the computer has set parameters for all the tables, in conjunction with the HO2 sensors, the program basically runs as calibrated . Full read and write capabilities with HP Tuners and EFI Live tuning software. LS1 plug and play-ability . Power relay system, and integrated harness fuse box. Custom trunk length is available.